Social Night Friday 16th of November. Just a short note to say tickets for our social night are now printed & available via Bill Nelson – if you want to purchase tickets pleae ring Bill on 01698 883675. There is good demand for tickets & we only have a limited amount of tickets left so would suggest you book early to avoid disapointment – tickets are only £7.00 each & the idea is to have a good social evening, celebrate the success & progess of the club over the past year. We will have a raffle etc. as well to try to raise some additional club funds & we would welcome donations for the raffle – thanks already to George Lockhart who has donated some of beautiful hand made floats check out the “Flee & the Float” . Thanks to Bill for organising the evening & look forward to meeting up with you all on the evening. Thanks to all our members for there continued support this season. 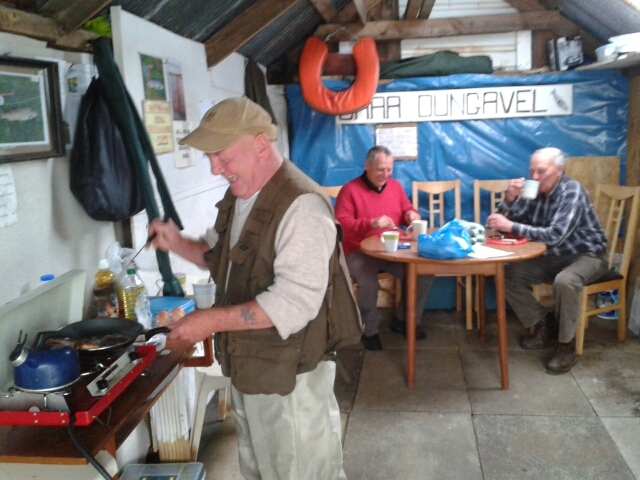 L to R Billy - Bill Nelson & JC Tait - being treated to a fried breakfast in the Boat House.